Snacking in front of the TV? Use a small bowl or eat frozen grapes and veggies with a yogurt-based dip, say health experts. (CNN) -- If you're trying to lose weight, close your eyes for a minute and imagine the moments that make you fat. Think through your day, and you'll see them, as big and obvious as a hot fudge sundae sitting right in front of you. You've been good all day, and wham, your friends suggest you go to a buffet for dinner; or you've diligently worked out and wham, you end up at a cocktail party with an array of the most killer desserts ever. Don't rely on your willpower to get you through these tough times, advises James Hill, executive director of the Anschutz Health and Wellness Center at the University of Colorado. "Willpower is not inexhaustible," he says. "You only have a certain amount of it, and it's gone." The problem: You're on vacation and you want to kick back, relax, and enjoy the local cuisine -- but you don't want to come home with pounds to shed. The solution: "Go for it," advises Frances Largeman-Roth, a registered dietitian and senior food and nutrition editor at Health magazine. But share with others. If you're in Paris, for example, don't skip a visit to the bakery -- that would be tres triste -- but share the goodies with friends. The problem: You want to bury your sorrows in a pint of ice cream. The solution: "Instead of meeting your friend for a drink to dish about your ex, meet up for a power walk or run," Largeman-Roth advises. Also, sign up for a team that is training for a 5K or some other race to distract your self and meet new people. The problem: You're at a party and everything looks delicious. It's free, it's in front of you, and no one's stopping you. The solution: Don't arrive famished, says Dr. Melina Jampolis, CNNHealth's diet and fitness expert. Eat a small protein snack before the party, such as a few slices of turkey, a half a cup of low-fat cottage cheese, or half a protein bar. Also, limit your alcohol, and not just because it's caloric, but because if it's hard to control yourself while you're sober, imagine how much harder it is while tipsy. 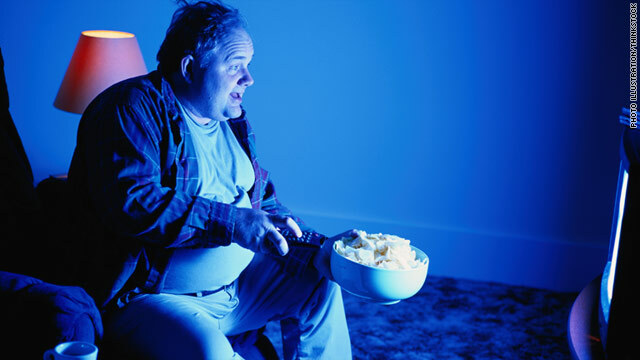 The problem: You want to plop in front of the television with a high-fat snack. The solution: Use a small bowl, Largeman-Roth says, or snack on frozen grapes or veggies with a yogurt-based dip. The problem: Buffets offer limitless amounts of food, and much of it has tons of calories. Restaurants with big portions of delicious foods make it hard to push the plate away. The solution: Simply don't go to buffet restaurants, Hill advises. But if you really have to, sit at a table where you can face away from the buffet -- Jampolis says studies show people who face away tend to eat less -- and load up initially on fruits, vegetables, and lean proteins so (at least hopefully) you won't have enough room for the bad stuff. At the end of the meal, she suggests having everyone at the table get just one dessert and share, so you get a little taste of lots of things. As for big portion restaurants, the trick is to get the doggy bag at the front end, not the back end. Hill suggests when you order your meal, ask for half of your dinner to be brought to you on a plate, and the other half in a to-go box.